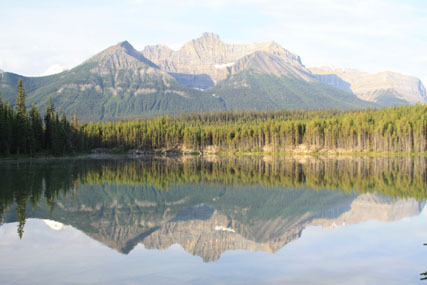 Just outside Lake Louise, we saw this stunning reflection on Herbert Lake. The drive from Lake Louise to Jasper in Banff National Park is only 188 miles, but plan for it to take all day. The reason: There are 13 viewpoints (and even more unmarked pull-outs) with magnificent lake and mountain landscapes along the way. 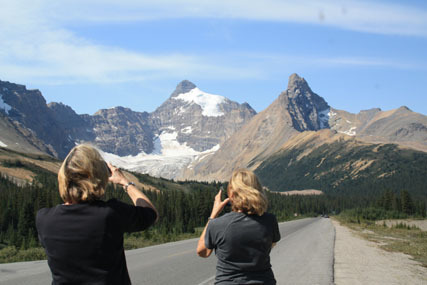 You’ll need to keep your camera handy because it’s very obvious why the Icefields Parkway, otherwise known as Hwy. 93, is considered one of the world’s great mountain drives. Peyto Lake's unusual shape has landed it on many postcards. We were just a few miles out of Lake Louise when perfect reflections on Herbert Lake caught our attention, causing us to turn around for picture-taking. Then we stopped to photograph Crowfoot Glacier, a spot with lovely wildflowers blooming and elk wandering around. Bow Glacier was visible when we stopped by Bow Lake. 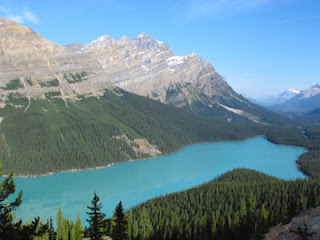 Peyto Lake, a lovely postcard-perfect destination, is recognized by its finger-like extensions at one end. A 10-minute walk on a paved trail led to the overlook where beautiful turquoise water is a reminder of the receding glacier that feeds the lake. Glaciers abound, so we took plenty of photos. Uplifts on mountain peaks are readily visible in the delineated strata. Fir, spruce, pine, and willow trees grow thickly along the roadside. Anemones, Indian paintbrushes, asters, and lupines are among the flower varieties we often saw. The day was sunny which made for stunning reflections on Waterfowl Lake and of different glaciers high up in the mountains. The Ice Explorer takes guests onto Athabasca Glacier at the Columbia Icefield. We arrived at the Columbia Icefield Center about noon and enjoyed an outdoor picnic lunch before taking the Ice Explorer Tour out onto Athabasca Glacier. After taking a bus to the base of Mount Wilcox, we boarded an Ice Explorer, one of only 22 in the world, for the 90-minute tour. Ice Explorers provide the safest way to tour a glacier, since the ice surface can be uneven, broken, or thin in places resulting in a potentially dangerous adventure. The vehicle waddles down a 32 degree grade from a dirt path onto the ice. Each vehicle has 10 huge tires, replaced every four year and kept at 15 psi in order to traverse the bumpy surface. 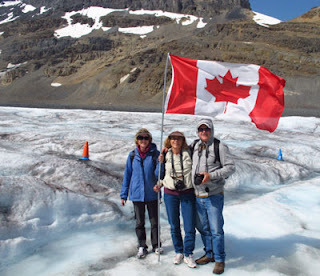 Posing with the Canadian flag during our glacier adventure. Out on the glacier, we had almost half an hour to explore on our own. Warned about slippery ice, crevices and thin spots, we stepped lightly (although I did see one lady break through ice up to her shin—wet and cold). I filled Larry’s water bottle with glacial flow and climbed to the top of an ice hill to pose for pictures. It was hard to imagine that we were standing on 3,000 feet of ice. As with all glaciers in the area, Athabasca has been retreating since the 1880s (when statistics were first recorded). 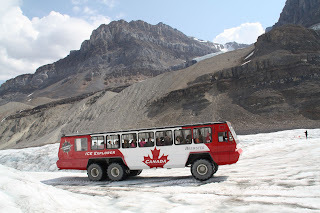 It’s possible to explore the Icefield area on your own, either on foot or by driving certain roads, but the Ice Explorer provided an incredible and unique experience. Back at the Icefield Center, we visited the Glacier Gallery on the lower floor, with displays that told about glacier formation and movement. A large fiberglass model showed the entire Columbia Icefield and helped us gain perspective for Athabasca Glacier, Wilcox Mountain, Wilcox Pass, and this entire frozen environment. Also at the Center are a restaurant, snack bar, and limited hotel rooms at Glacier View Inn. The best thing about these options is the stupendous view on clear day. After basking in the breathtaking scenery, we headed on to Jasper, with the Icefields Parkway paralleling Athabasca River. 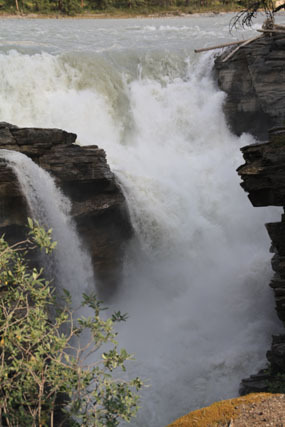 Twenty miles south of Jasper we stopped at Athabasca Falls. Here turbulent water cuts through boulders creating new paths in a narrow gorge. Rock walls of the canyon are multi-hued and layered like ridges of stacked cardboard. Walkways lead to multiple viewpoints above and below the falls, each spectacular sight enticing us to keep clicking our cameras. Ten hours after beginning this incredible journey we arrived in Jasper.